Choose seven photos, they say. This .. could take awhile. Nominated by my dear Cat Gaa of Sunshine & Siestas, I’m happy to catapult my seven shots out in the world. In case you are thirsty for more, be sure to visit Kaley’s collection (of Kaley y Mas). Greece is a place with deeply rooted history, both true and mythical – so it is no surprise that the country held many breathtaking moments for me. 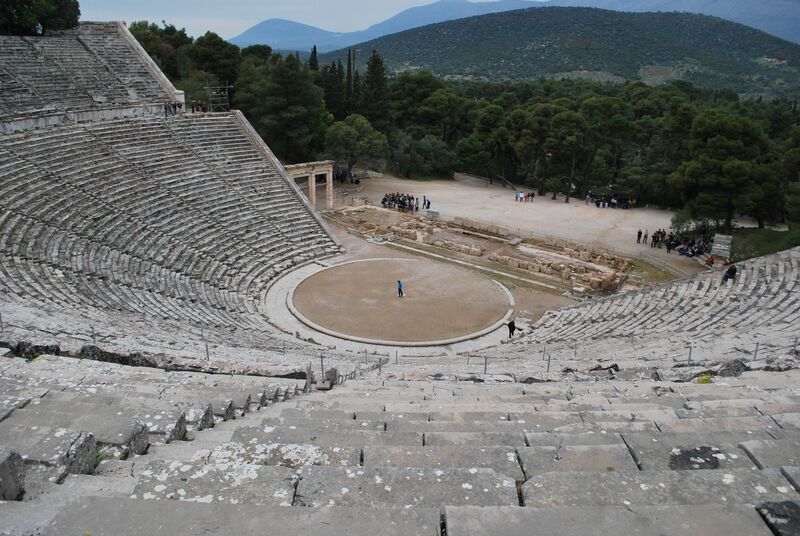 Here, in Epidaurus, sits an ancient ampitheater, largely intact and nestled into a mountainside. What you can’t see is the coin that was dropped by the girl standing in the middle of theater. She is barely the size of an ant from our viewpoint at the top, but I could hear that coin as though she dropped it on the stone next to me. Given perfect acoustics and mathematical genius, any noise made in that exact spot, will echo all the way up to the nosebleed seats. It was a perfectly isolated moment, when the tourist noise died down, and the soul of the place rose to the occasion. This may not have the views of the land we flew over, or the sunset vistas, but this makes me smile. 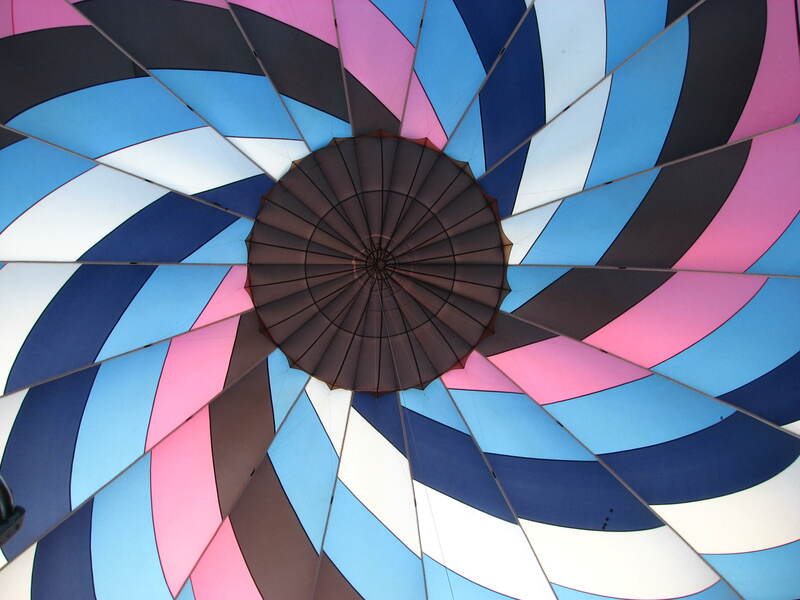 I took my mom for a hot air balloon ride as a belated mother’s day gift. Have Balloon Will Travel let us assist in the prep and take down of this glorious contraption, and led us over the rolling hills of New Jersey on a summer evening. I don’t know about you, but when my mom smiles, I smile. One of the best sounds in the world is water. The grandest of these, the ocean. Maybe it’s the tides and the moon and the awesomeness of nature – whatever it is, I like it. On this day in the far north of Spain, Natalie and I watched the ocean for almost an hour. 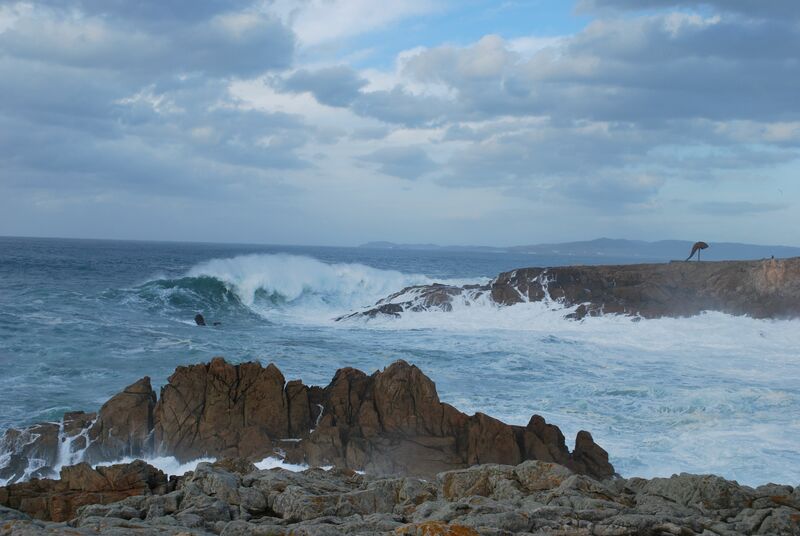 With a storm approaching, the waves were irregular and gigantic. Every strike on the rocks was dramatic, and I took over 200 photos as Mother Nature roared for us. There are also photos of us “conducting” the waves .. if that’s not dreaming, I don’t know what is. Leading a group of 8 students to Nicaragua may sound like a vacation, but it was not all beaches and palm trees. My students and I stayed with generous host families in the city of Granada, and both new and seasoned travelers were dazzled by the differences. 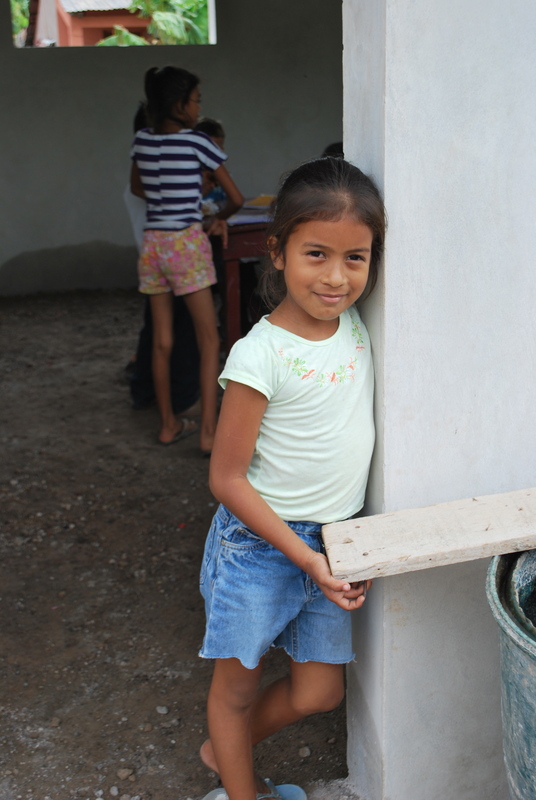 One afternoon we went to a local after school project in a rural neighborhood, bringing school supplies and snacks. It was a brief visit but a powerful one. My group was swarmed by students, chattering in high pitched Spanish and throwing their arms around us for hugs. Students between the ages of 5 and 15 crowded the small space and stared at us openly – smiling, laughing, talking. I caught this quiet girl as we were leaving. I called her beautiful and for this, I am awarded a smile. This photo makes me think because I’m wondering: where will she go from here? I take a lot of food photographs. So many that you were probably waiting for this question. I have a love affair with food, it’s true. I recently saw the descriptor “people who travel to eat” and that is exactly what I’m into. So why the photo of an empty plate? 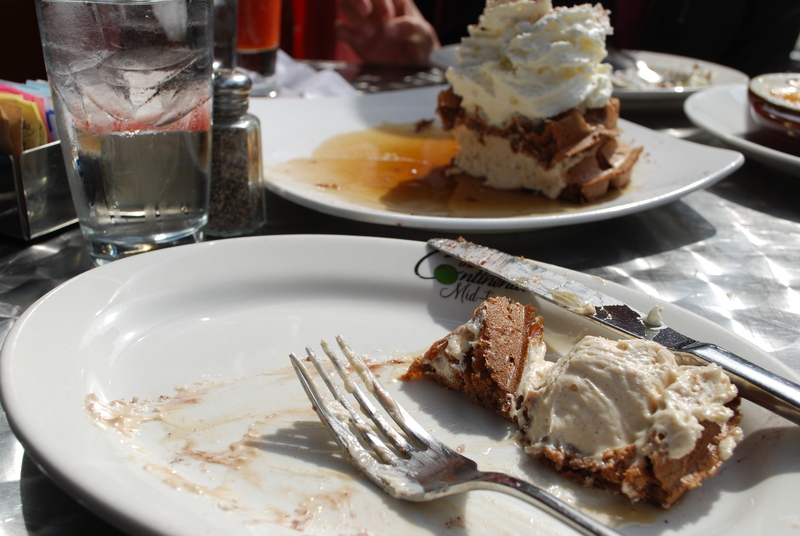 The empty plate photo is a stamp of satisfaction – my compliments to the chef, as I demolished the dish set before me. In this case, epic brunch at Continental, Midtown in Philly. On our last morning in Manuel Antonio, Costa Rica, it’s already hot at 6 a.m., and I can hear the monkeys hooting to each other in the canopy below. I walk out across the deck on bare feet, and place my hands on the already warm railing. Looking over the edge several flights down, I see the bright aqua of the pool, and the surrounding white chaise lounges. And monkeys. There are 4 or 5 white-faced monkeys chasing each other around the pool like something out of a cartoon. I streak back into the room, bark at Thao to wake up, grab my Nikon and rush back outside. 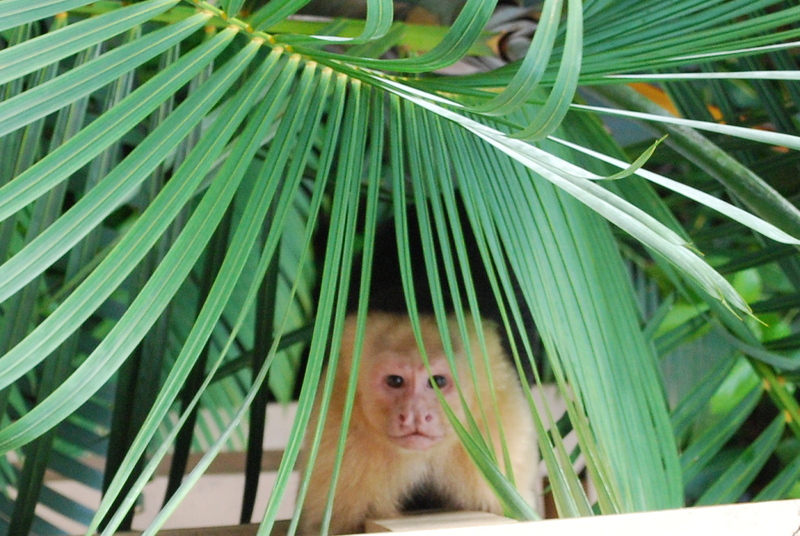 The group takes to the trees and a lone monkey takes purposeful strides up the bark of a palm tree like he owns it. He swings toward a lower level balcony just beneath us, and continues to climb – directly toward Thao and I. I lean over to risk this shot, and back up (still shooting) as he levels with us. Without a second glance, he reaches upward and swings out of sight, leaving us wide awake and all giggles at our simian encounter. Difficult category. 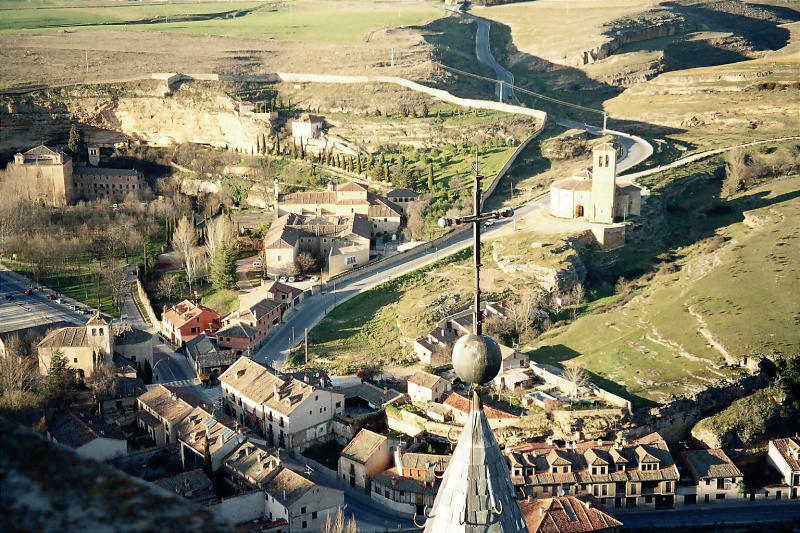 This is one of my favorite photos, taken from the top of the Alcazar in Segovia. Millions of tourists like have the same one. I was learning a lot about photography and composition and captured some really great photos that year. This is one of them. And now for my nominees ..
From over 600 photos, here are 12 of the most emblematic (for me). Food, religion, nature and ancient history .. Greece in a nutshell, if you will. We ate well, we toured a great deal of ruins, watched a community prepare for an important holiday and sped by beautiful views along the way. A return trip is imminent. The Spanish word for ants is hormigas. Thao and I used this word with great frequency during our sightseeing stops because the sheer number of people clambering on / over / around the archaeological sites resembled an anthill. Always most apparent from a great distance or at a high elevation, sometimes you turn the corner and there is just a flood of them waiting for you. Yes it’s fun to share great wonders of the world with your fellow humans .. to a point. Please promise me if you yourself are a tourist you will go forward from this post with one important thing: respect. For other people, buildings, ruins, sites, guides, guards and just about everything. Behave yourselves! Travel karma is a witch. Delphi has it’s own fair share of ants. We start early but are still hounded by the tour groups. We start at the museum which is full of votive offerings and other statues uncovered from the site. 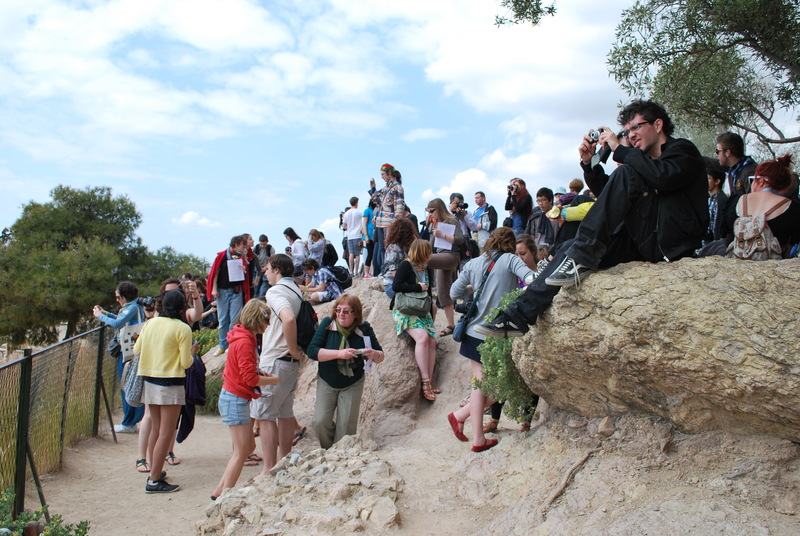 Eavesdropping on tour guides we learn a bit more than what is offered by signage and entrance pamphlet. The signage here is very text heavy and our eyes are crossed before long. Drifting from statue to statue we make our way to the Charioteer – the most famous piece in the collection. This is the remnant of a sculpture which was previously a man on a chariot drawn by four horses. All that remains are several pieces of the legs and the statue itself, with a handful of reins. Apparently he was buried and preserved over the years – from approx 467 BC to 1896 when he was discovered on site. The ruins are beautiful, but I think half of the appeal is the natural surroundings. The columns of the Temple of Apollo are striking with the mountains in the distance and the valley below. The stadium is simple, and after the long trek uphill I admit to being slightly disappointed. The theater pales in comparison to the one we saw at Epidavrus, and now that we’ve seen several we move on without much interest. We take our bagged lunches from a local shop down to the Temple of Athena, parking the car nearby for a quick departure. The Temple of Athena is populated by several Spanish tourists demanding photos and a photogenic black and white cat who poses gracefully in front of the temple’s columns. She looks over her shoulder as if to say, I don’t know who the hell you people are but this is my place and you are blocking my sunlight. Leaving Delphi at 1 p.m. we arrive to our hotel in Athens at 5 p.m. We drive past a whole collection of random things while traveling on the old national road (secondary, toll-free). These include goats climbing on a car, a tree decorated with water bottle ornaments and strange exits and forks in the road that appear to lead to random lots, not to Attica. When we finally spill into Athens after another stressful drive, we are ready to pass out. We try to motor through the afternoon powered by ice cream and souvenir shopping. Once again we turn to shrimp saganaki for dinner and rely on our food coma to get us through an evening full of church bells. Thursday morning I wake up to the sound and smell of someone mowing the lawn and am temporarily disoriented. The sun is shining and for the first time in days it is warm enough to walk around outside. We have decided to forgo Sounion and will spend the day in Athens. Unfortunately our morning is not nearly as stress free as we had hoped, as we spend over an hour looking for the Cocooun Urban Spa in Exarhia. Despite several phone calls to the staff, we walk approximately 1-2 kilometers in the wrong direction and end up taking a cab back. Even the driver doesn’t know where we’re going, so Thao puts him on the phone with the salon. We can’t tell if Greek is angry or just loud (like Spanish) – but we ultimately end up on a small side street in front of the spa, 30 minutes late. They honor our appointments for signature facials, and we unwind for awhile. After finally coming back into the center of Athens, we descend on a French bakery called Paul’s for lunch. Our chicken curry baguette, cold vegetable pizza and mille fiuele are served with a nasty attitude that is only surpassed by the tastiness of the food. We post up at the Numismatic museum (aka old currency place) – where a small garden cafe gives us a table in the sun and two cappuccino freddos. We spot a fellow diner who looks like he’s wearing the fake nose / black mustache / thick glasses disguise .. but he’s not. Our hotel has a rooftop terrace, so we haul our dessert to the top and sit in the sun, deciding to take the metro down to Piraeus to explore and ultimately to locate a fish taverna for dinner (always thinking of food, as you know). The tracks take us past the Olympic Stadium (“Peace and Friendship”) and deposit us near the water. We watch a chaotic entrance / exit of a giant ferry accepting / depositing both cars and people. The smart cars zoom in first and the scooters careen onto the ship without killing anyone. But the trucks haven’t even exited the boat yet .. does no one have any patience? The pedestrians are storming the gate as though the ferry will pull away at any minute, and cars filled with Easter presents and suitcases line the dock waiting to make their approach. We walk out past the cruise ships that are larger than buildings and once again walk farther than we originally intended. Today we will take 3 cabs, the only ones we’ve taken during the entire trip. One, to the spa. One, to rescue us from the wrong end of the port. One more, to take us back to the metro stop after dinner. Zea Marina is a posh area full of yachts and well to do Greeks. We stop at Flocafe for wine and beer before moving on to a fish taverna whose name we can’t pronounce. Intimidated by fellow diners with numerous plates on their tables we commit to several dishes: Greek salad, stuffed grape leaves, shrimp saganaki with ouzo and grilled stuffed squid. Fat and happy we slump into a taxi after dinner and head to the metro stop, listening to a Greek mass on the radio. Once on the metro we forget that we need to switch trains and sit quietly while the train starts to travel in the opposite direction. Correcting our mistake we hop out at Syntagma Square and take a brisk walk home past skateboarders and cops, passing out in the midst of putting in my earplugs. Friday is my last day in Greece, and I am headed for the airport around 3pm. It is Good Friday and the cathedral bells have been chiming all morning. Thao’s Greek friend picks us up and takes us to Mount Imitós over 3,000 feet above the city. It is easily one of the most serpentine roads we have driven on, but the view from the top is worth the nausea. The city of Athens spreads out before us from sea to mountains and everything in between. It is outrageously beautiful, and we stand there shivering quietly while the wind whips around us, trying to take it all in. We enter the city again in hopes of finding a kebab but fail miserably. Chocolate sorbet saves the day, and we make a trip through Ermou street so I can pick up some airplane food from the street vendors. Later in flight I am grateful for the sesame ring and coconut stick. Is a layover such a bad deal if I get to have gnocchi for dinner in Rome? It is when they switch our gate at the last minute and then delay our flight anyway. Arriving in Barcelona at midnight I am exhausted and anxious to find a place to sit for the five hour layover I have ahead of me. I would love to photograph the kid at the ATM who is wearing a backpack and carrying a sombrero, pushing every button possible. It is part of the concert of late night airport noises: whirring floor cleaner, security guard’s squeaky sneakers and quiet chatter in other languages. Saturday dawns with my approach to Sevilla, and I am back at home and in bed a few hours later with almost 600 photos to upload. Greece is already a memory and I am looking at the calendar wondering where the time went. If you’re interested in seeing our route, here are the basics. Photos in the next post, I promise! We buy another map and buy breakfast at another bakery (are you following the theme here?). The cashier gives us a slice of Easter bread to try and tucks an olive loaf into our bag for free. We buy a sesame ring with cream cheese and it is the first semblance of a bagel I’ve had since September. It only seems fair that we take a box of cookies for the road. Over cappucino freddos we review a local spa menu and lament our aching bones. The hotelier is happy to call the spa and speak some Greek for us so we can book an appointment for Thursday. Sitting in Athens traffic once again, this small fact makes us smile and roll our sore shoulders in anticipation. We spend most of the drive in shock over our surroundings as they include soaring mountains with snow capped peaks and deep valleys full of olive trees. More than once I catch my breath when we take a sharp turn and the landscape leaps out into view in our windshield. We stop at more than one parking site to take photos and stretch our legs. It becomes impossible to photograph all of these views and we continue to wind our way westward. En route to Delphi is the tiny ski town of Arahova. We find a parking spot on a small side street and settle into a taverna with a beautiful view. The menu is full of some of our favorites but we try several new dishes, all traditional Greek. The most interesting is Tarahanes (sp) soup made of milk and semolina, served warm. My eyes glaze over after I taste a pumpkin, feta and gruyere pie and I contemplate proposing marriage to the chef, sight unseen. There are filled potatoes that pack a punch with garlic and spices, and baked leg of lamb with lemon. We are fit to bursting when the waitress trots out a complimentary dish of Greek yogurt. In a beautiful terra cotta pot and hidden under a layer of the thickest honey I have ever tasted, who can refuse? All this for just 28€. The only sour note is the indoor smoking which has plagued us at nearly every restaurant. Even though I repeatedly open and slam the window shut, the girl continues to puff away in our small terrace enclosure. Back into the fresh air we explore this quaint and beautiful town, scaling huge staircases and admiring expansive gardens. The view from the courtyard at the top cannot be beat, and we stand with our faces to the sun taking it in. Even the birds are singing loudly and who can blame them? The air smells like chimney smoke and our attention is drawn to the occasional doorway bearing ashes in the shape of the cross. Two small boys slowly pass a soccer ball back and forth, mimicking their grandfathers walking with their hands clasped behind their backs. At another overlook, the wind picks up and the temperature drops among the pine trees. It has been cold and windy here but we are blissfully without rain. We counted a whopping 124 roadside shrines (kalakynades) from the Ochomenos exit to Delphi. Later google uncovers an article about the nature of these miniature churches, claiming they are placed at the sites of lost lives. They remind me of travelers shrines that appear along the paths of pilgrimage like Tibetan prayer flag or othe markers. Lost life or otherwise, someone thought enough to put them along the route and we point them out at each curve. Delphi is adorable. We drive up and then circle back down to find Hotel Hermes. Room with a view is an understatement! Standing outside on our balcony I see a tiny Greek lady tending a shrine, our #125, just below. It is a relief from the rowdy underage school groups parading through the streets with beer bottles in hand. We find pashminas with the Greek key design and skip dinner in favor of two cups of hot chocolate. Tomorrow, its an ascent to the navel of the world and the site of the oracle. Monday means a return to Athens via Mycenae and Korinth. In celebration of National Monument Day we luck out with free entry to the site (normally €8). After reviewing the bus schedules to Delphi for the following day, we decide to keep the car. The ability to come and go as we please, stopping for a beautiful church here or a curious sign there – so worth it. Mycenae is enveloped in tourbuses and crawling with French kids presumably on an excursion. We wander through the ruins detouring each time they cross our paths, loud and oblivious to the fact that other people are trying to read signs or take photos. I am at my limit when I am forced to clear my throat in an effort to encourage a young girl to please remove her feet from the sign I am trying to read. The sigh she heaves is larger than life, as I am an incredible inconvenience. Korinth is sad and devoid of English. In typical fashion, Thao and I provide great entertainment for the locals who are blatantly curious about the petite Asian and tall blonde. We dip into a bakery for some sustenance, forgetting our intention of a leisurely lunch by the water. Motoring on to Athens we attempt to find the Korinth Canal, a four mile long stretch of water that is barely wide enough to permit freighters. We nearly fly right past it and screech into a parking lot. Walking out onto the bridge we see a bungee jumping set up and raise our eyebrows at each other. But it’s far too windy and far too cold.. or at least that’s what we tell ourselves. The walls are over 300 ft and they were built over a hundred years ago by the Hungarians. Grabbing two freddos to go from a roadside cafe, we commiserate with a family from Texas who are traveling with a group of 8. The frazzled mother details a stressful day of unsuccessful sightseeing, and I admit we just came from where they were trying to go. We take solace in our cappuccinos and our trusty maps, bidding them a good journey. We go toll free on the way back into the city, and the view is stunning. An enormous expanse of water stretches alongside the car, and mountains flank our other side. The word we use the most while driving is “fake” because the natural beauty is so mindblowing it can’t be real. Our vocabulary changes significantly and becomes a great deal more colorful as we descend into Athens. Unbeknowst to us, a political rally is taking place in Syntagma Square, resulting in a incredible snarl of traffic and hostile motorists. After a white knuckle drive through the city, we park on some random corner and stalk to the Hotel Metropolis. It is pure karma that a private parking space for guests exists in front of the building and we drop our things only to go back to the car and begin again. Standing with the city map spread out on the car, a kind English speaking gentleman asks us if we need help. I could kiss him. We are equally fortunate when a policewoman at a catastrophic intersection answers my questions and points us in the right direction. Thank god for people like these. We dive into pasta and salad at an Italian restaurant and come up for air only after plowing halfway through two desserts. At this point we would not be disappointed if we never saw another map or ruin ever again. But we will, tomorrow.